This 40-story, Art Deco tower would be one of the most distinguished buildings along Central Park South were it not for its large rooftop sign that proclaims its name. The sign unfortunately has been one of the city's worst skyline blights for decades. The hotel, which was designed by Frank Grad, was originally called the Park Tower and then the Seville Towers. In their fine book, "New York 1930, Architecture and Urbanism Between the World Wars," (Rizzoli, 1987), Robert A. M. Stern, Gregory Gilmartin and Thomas Mellins noted that "there was little architectural rhetoric in the design; so little in fact that the hotel erected a huge illuminated sign on the roof to identify itself." Of course, the Depression was not a great time for luxury hotels. While it is true that this building's massing and design is conservative, indeed, laid back, it is nonetheless imposing in scale and appropriate for its context. Moreover, the rich ornamentation of its base is impressive and a good hint that the interiors might be special. 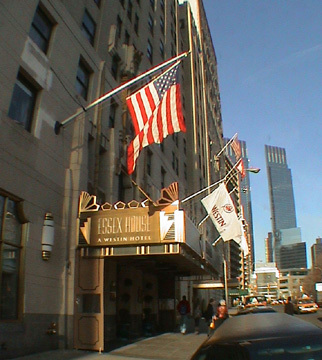 From the narrow sidewalk, of course, the rooftop sign is not visible but the hotel's handsome marquee and large Art Deco-style, gilded decorative elements along its broad base are. They are merely flourishes but are quite dramatic. The property has changed hands several times in recent decades and now operates as both a hotel and a condominium. 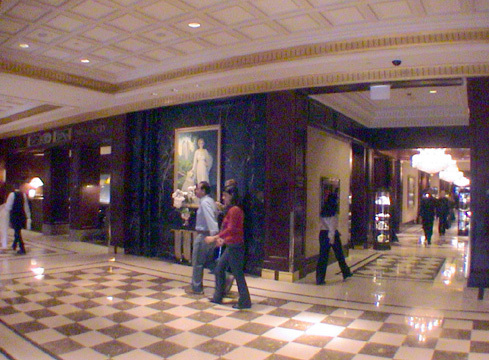 Both the hotel, which until 2006 was operated by the Westin chain, and the apartments, now in the "St. Regis Club" section of the building on the 19th through the 39th floors, share one of the most impressive lobbies in the city. The lobby extends through to 58th Street in a narrow, but handsome corridor along which are located the elevators, which have handsome Art Deco-style cab doors. The broad lobby facing the park has tasteful and comfortable seating and exceedingly impressive black-marble columns of very distinctive form. The ground floor also has a very large and handsome and very expensive restaurant. The tower was erected in 1930 and the condominium conversion was in 1974. This block, between the Avenue of the Americas and Seventh Avenue, is the most elegant on Central Park South as it boasts the great and distinctive mid-block rooftops of the Trump Parc building and the Hampshire House and the imposing Italian-Renaissance-palazzo-style New York Athletic Club on the west end. Like all Central Park South buildings, this building has great vistas of Central Park and the skylines of Upper Fifth Avenue and Central Park West. The building has a doorman, several concierges, and a garage. Good public transportation is nearby as well as excellent shopping and numerous restaurants including one run by Alain Ducasse. 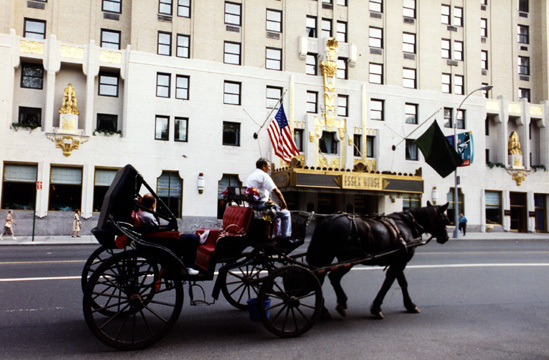 Historically, Central Park South was for many decades a surprisingly unattractive location despite its great location because of its narrow sidewalks, high traffic, a proliferation of street people who patronized guests at its many hotels and a lack of normal residential neighborhood amenities. At the end of the 20th Century, however, its ambiance improved significantly with the erection of several new luxury towers nearby and the opening of new restaurants and a supermarket not too far away and the long-delayed redevelopment of the New York Coliseum site at its western terminus into the Time Warner Center that opened in early 2004. With the elegant stores of Fifth Avenue and the boutiques of Madison Avenue nearby to the east and the varied attractions of the Lincoln Center district a few blocks away to the west, this location is very prime. In the 1990s, Japan Airlines spent more than $130 million in renovating the property and in 1999, Strategic Hotel Capital bought the Essex House for more than $300 million and hired Starwood Hotels & Resorts to manage it. In September, 2005, the Dubai Investment Group paid $440 million to acquire the hotel portion of the building, with 606 rooms and 9 of its 148 condominium apartments and in early 2006 began a $50 million renovation program. In a February 28, 2006 article in The New York Post, Steve Cuozzo said that Frank van der post, a senior vice president with Jumeirah, said that "no more than 15 percent of guest rooms would be converted" to condominiums, which would bring the total of such units in the building to about 247. The hotel marquee now proclaims "Jumeriah Essex House" reflecting the fact that Jumeirah Hospitality and Leisure has been designated by Dubai Investment to manage the property. Jumeriah operates several properties in the United Arab Emirates including the sensational Burj Al Arab hotel in Dubai. If the rooftop sign were to be removed, this structure would be recognized as a very good and handsome Art Deco skyscraper.